Thread: Organization... for now....Suggestions please! Dealing with health challenges right now which means I can't get to my sewing room and stash. Suggestions for how to add storage shelves to a utility room coat closet without major cash outlay? I have my dining/sitting room organized for actually sewing and it's working quite well. But, I'm constantly frustrated when it comes to having someone who may or may not be acquainted with sewing or quilting fetching things and fabrics for me from my upstairs sewing room. And to further complicate matters, my room was fairly ordered when I was last up there in November/December but has since,with the things that have been returned to the room not being put away, become very "piled" with things. We did take pictures in January but what with sorting and purging and getting set up to sew again... well you can imagine what it looks like. I am going to go upstairs and clean/sort next time my DS comes and then take new pictures. So I need suggestions on what I could bring down (scraps? precuts?, keep it to projects?) and anything else you can suggest. Storage is limited to about 3" wide and 60" tall and I'm hoping to Not buy anything. This is what I have right now - the coats will go upstairs once the weather Stays nice. And I would get rid of the metal shelves if I could replace them with something similar but larger. And the bath chair in the corner will fold. If the coat are moving soon, you could put some fabric/rulers and other things on pant hangers on the rod. Underneath the hanging things, a laundry hamper could store scraps? Good luck with your reorganization ! I would re-do the closet with the adjustable shelving system. We installed these systems in all our closets with initial costs approx 100-150 each. Leave room to bring the coats back down during the next season. Once the system is installed, it can be re-arranged according to needs. The other option is to use the plastic drawer containers and label contents. Best wishes on your health concerns. I think it's great you are thinking what you would like to have that will make your quilting more accessible for you. Having a list will make it so you can play whenever you feel like it. I think you need at least the basics, cutting mat, long ruler, scissors, seam ripper, pin cushion and thread. Maybe a few books or magazines or patterns that are favorites that will inspire you. Your Iron and Ironing Board. Precuts are always good or scraps. Do you like to add a constant fabrics to go with them. I use lots of white. So, I would need my bolt of white fabric. Think about what you like and enjoy working with. Otherwise, inevitably, the things you need most will be out of reach. Can you re-purpose a piece of furniture to hide your goodies when not in use? Storage doesn't have to be expensive. Do you have an baskets you can repurpose? Or, I picked up baskets from the Dollar Store. They have great selection in lots of different useable sizes. What about one of those cute little 3 stand carts from Walmart. I picked up one that sits next to my sewing machine. It is handy. I use the top shelf for my quilting do-dads and the bottom 2 hold triangle scraps and the one under that has Hunter Star Blocks precut that need to be pieced and a longer term project that holds precut kaleidoscope blocks that need to be pieced. You of course can store whatever is handy for you. I think I paid $25 for it. Love this little cart. So handy. And, on wheels. Love my organizer from Michaels. It rotates. Repurposed little stand with Dollar Store Baskets. So handy for those strings or scraps. Repurposed single chest of drawers. Or any repurposed piece of furniture. It could also be a nightstand which I also have in my sewing room. Do you have any Desk organizers that can be repurposed. I saw someone else on her (Zoezee, I think.) I was able to pick up one for $10 with a coupon at Michaels. And, score, it rotates. Love it!! handy. Here's so photos to get you thinking outside the box. Yep, just a peak inside the drawer. I also use little holiday bread containers from Walmart. Sold on the holidays for $1 to sort FQ's that have been cut into. In the fronts of the colors. Just think about what you have already in your house and what you can repurpose. You never stated how long you may not be able to get to your dedicated sewing room. Oh, and think command hooks for hanging things like rulers. Hope this gives your brain a nudge. I hope you heal quickly and can access your sewing room in the near future. I'm a believer in using what you have around the house that can be repurposed. If the coats were gone, could a small bookshelf fit in that space if you have one? On one of those little carts? or even a couple of end tables? Anything with a shelf and a flat service on top can hold lots of stuff. Square plastic containers that you may have in your kitchen can hold scraps and pre-cuts and could be stacked on the top of those bookshelves or end tables. And, don't hesitate to get someone to go up to your sewing room to bring down stuff you need upon occasion. They won't mind helping you. Just continue to enjoy your quilting and get well soon! Don't forget to bring down batting if you have it. I have no idea where you could store it. Maybe behind furniture? If your health limits are temporary I wouldn't worry too much about looks until you can climb steps again. Maybe your Son could think up more space when he gets there. 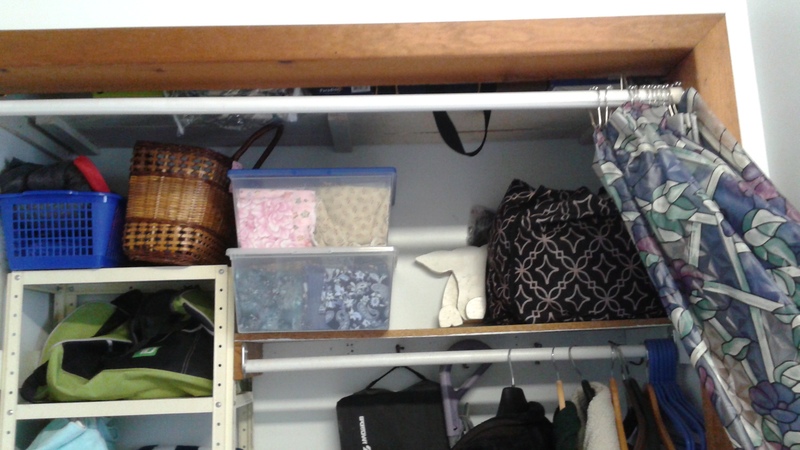 A hanging shoe rack in the closet would provide several cubbies to store fabric or supplies. Sure wish I could come help because I have gone thru bins and given some away. I have an IKEA in San Diego that had the best metal shelves and were under $50.00 that fit in my closet. But if I had a book case, I would have used it. My daughter collects plastic sups from ball parks. She uses them in her class room for holding pens, pencils, and scissors. I use some items I brought home after our office closed, like the metal file holders for long rulers and my Accuquilt dies. And the over the door holders works great too - my daughter was throwing it away and it works great to hang things on using the hangers with clips. I have a couple of the plastic drawer sets you can find at Walmart or Target. Not crazy about them but they fill a purpose. I have one out in the garage I need to go thru and get rid of it. Costco has fruit boxes that are about 20 in. x 15 in. maybe 5 in. deep, and they stack well together. I have used them for projects. I travel to my friend in Phoenix and discovered how much they hold, how well they stack together. If they are dirty I don't use them but most are clean. I don't use them for prolonged storage, and have not had any problem with the fabric. You could line them if you are concerned. Last edited by quiltingcandy; 04-14-2019 at 10:03 PM. If you can only go upstairs when your DS is there maybe the best thing would be to gather what you need for a few projects. Before you go up list what projects you want to do next. Plan on being up there for awhile as you find the patterns and everything you'll need for each project. Maybe batting can be brought down closer when you will actually need it. Organize the space again and take detailed pictures so if you need someone to go up you'll be better able to describe what you need and where it is stored. If this is going to be a long term health challenge consider looking for a used stair lift to perhaps enable you to go upstairs at will. Before I married my current husband,I had a duplex I rented with my 2 small children. I had no extra money and little space. I was renting and could not nail anything. I bought several square concrete blocks. They were like 12x12 and 4" thick. I laid 2 down and placed a 1"x10" board on top of it to make my own shelves. I made 3 shelves in a coat closet. The top shelf held my portable sewing machine. This closet was only about 3 ft wide and not very deep. Maybe something like that would work. It is solid but temperary. Back then the blocks were about $1 each not sure about now that was over 40 yrs ago. 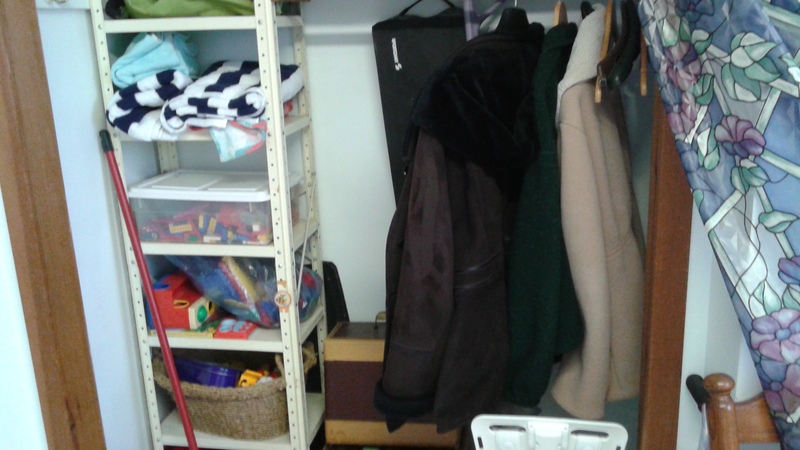 You asked "Suggestions for how to add storage shelves to a utility room coat closet without major cash outlay?" I bought a set of put together shelves like the one in the link below and put it into a hall closet, works great. These type shelves just slip together with no tools needed and come apart just as easily. They also come in different sizes and I think sterilite makes some as well. They are also available at different stores....Amazon carries a wide variety of storage shelves too. Hope this helps and you get better soon. I have done the same... but an 18" deep one just fits in my large storage closet in my small apartment. The large clear tubs fit nicely on the shelves and i can see what's in them. Such wonderful suggestions and great pictures...best of luck as you move through this hopefully temporary situation.